Here are some questions that we are frequently asked. If your question isn't answered down below, feel free to contact us. Why am I unable to build? If you're unable to build, it's probably because you are in the spawn protection area. To leave it, simply walk away for a bit until you're able to build. 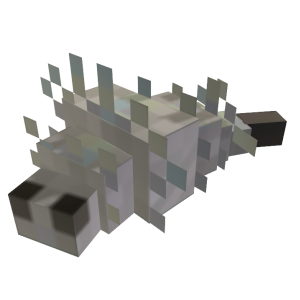 Alternatively, the spreader will teleport you in a random location outside of the spawn protection area. It is located behind the spawn, in a small cave. My house was destroyed. What can I do? There is not much that can be done once your house is destroyed. As stated in the rules, griefing/raiding is allowed on our server. To reduce your risk of being raided, try to build quite far away from spawn, and do not reveal your coordinates to players in which you don't trust. Which plugins is the server using? We are a vanilla server, so we don't have any plugins at all. However, our host does provide us with a panel that help us create commands such as .spawn, .nspawn, and several others. Why is the server rebooting so often? The server reboots every four hours when players are logged in, and every hour when nobody is logged in. The purpose of rebooting is to clear memory from the server, which significantly helps reduce the risk of lags and crashes. Is this a kid friendly server? Unfortunately, this server isn't really kid friendly, as swearing is tolerated in the chat. We recommend to be 13 y/o or older before joining the server. When will the next world reset happen? Our worlds have tended to last around one year, this usually depends on Minecraft Updates. Though we communicate whenever a reset is being planned. What is the world seed? To prevent abuse from happening, and to keep the server unique, the world seed is kept confidential. By making the seed public, players would be able to generate a replica of our world, look around for loots, and then track the loots back on our server by going to the exact same location. Can I use modified clients? Modified clients or mods that affect gameplay, such as Fly Hacks and X-Ray mods or texture packs, are not allowed to be used on our server, and offender to this rule will receive a ban without any prior warning. However, mods that do not interfere directly with gameplay, such as OptiFine, are allowed. Can I connect to the server using MineChat? Absolutely! We totally support people using it. For more information about MineChat, please visit their website. Minechat may become outdated if snapshots change the chat protocol frequently, though the Android version is usually updated faster due to shorter review times than IOS. Is there a safe-room for MineChat users? TBA. - Unknown right now. Where can I apply to become a moderator? We don't often open Moderator applications. However, if you are a good and well-liked player, we may ask it to you ourselves. Please remember that asking to be a moderator through the chat is against the rules. Does this server have a voice chat? Yes! We have a discord server, the link can be found on the home page! Can I advertise this server on other servers? No. We do not support people advertising their server on our, nor do we support our players advertising our server in other ones. Can I put this server on a server listing site myself? We prefer to advertise our server on listing sites ourselves. If we see that our server has been added on a listing site by someone else, we will ask for it to be removed. What are the server configs? We use normal biome settings. These settings usually do not change when we reset maps. Where can I report a player? If you would like to report a player who is hacking or breaking the rules, simply head over to the Report Player page and fill up the form with the asked information. We will e-mail you shortly after you send us the form, after which you will be able to send us a screenshot or a video to prove your point. I think I have been wrongfully banned. What can I do? Will I receive a reward if I vote for the server? We don't want to force our players to vote, so you won't get a reward for voting. However, voting will increase our server visibility, which will in-turn make the server more alive with slightly more players joining. commands aren't working. What is going on? If /trigger commands are not working this could signify a scoreboard file corruption, which is usually automatically corrected at every 45th minute of each hour -- though please let staff know either via contact us or in the #Report channel in discord. If chat commands are not working, this could mean the console is being spammed and the panel cannot read the chat fast enough to catch your command. In this case, please resort to using /trigger commands for the time being. When the server reboots, does that reset the map? No, It just stops the server and starts it back up again. Think of it like restarting your computer. Why is there players constantly joining and leaving? Since our server is promoted by MineChat, there's often MineChat users joining the game, and they often leave very quickly. It's also the reason why they don't move away from the spawn point. I'm lagging, is there something I can try? How does the Vote RESPONSE work?